It uses the CBROM command-line tool to hook its extension into the BIOS. The next time the system boots, the BIOS extension adds additional code to the hard drive's master boot record (MBR) in order to infect the winlogon.exe / winnt.exe processes on Windows XP and 2003 / Windows 2000 before Windows boots. The next time Windows launches, the malicious code downloads a rootkit to prevent the drive's MBR from being cleaned by a virus scanner. But even if the drive is cleaned, the whole infection routine is repeated the next time the BIOS module is booted. Mebromi can also survive a change of hard drive. 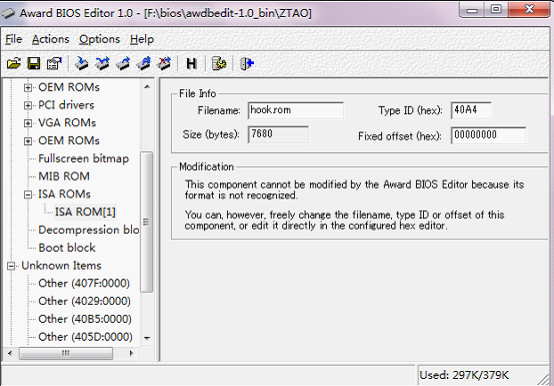 If the computer doesn't use an Award BIOS, the contaminant simply infects the MBR. 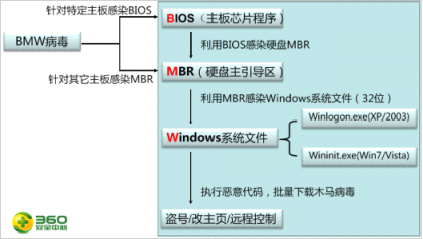 If the system uses a BIOS other than Award, the Trojan skips trying to write to the BIOS, but still tries to infect the MBR of the boot hard drive.Removing the virus from the MBR and infected files really has no effect, because as soon as the system is restarted, the BIOS is read and the computer re-infected again.Seeming most virus companies will not want to create a BIOS cleaning utility, most likely the BIOS would need to be re-flashed to remove the virus infection completely.